Today more than ever, companies are striving to use innovation to stay ahead of the competition. This mission is exceptionally accurate here at The Home Depot. Our company has continued to thrive even though the retail industry has seen significant declines. While some of this success is due to the booming housing market, there is also a direct relationship with our culture and how we innovate. Over the next few months, I will be discussing how we use Design Thinking and specifically Design Sprints to fuel innovation within our product teams. The series starts with a foundational understanding of Design Thinking and how Design Sprints fit within the overall ideology. Next, I will discuss best practices both within the industry and specific applications here at The Home Depot. The topic of the third article centers on creating a culture of innovation. Up next, is an inside perspective of how to successfully scale Design Sprints within an Enterprise. The series closes out with a future look at the Design Sprint framework, both within the industry and our product teams. It’s an exciting journey that I am thrilled to share with you. Many companies are turning to Design Thinking to extend the designer’s approach to problem-solving. Specifically, Design Thinking balances the competing constraints of desirability, feasibility, and viability to approach innovation. Through the process, teams use empathy, experimentation, and refinement to explore solutions. Robert Curedale defines Design Thinking as “an approach to designing that supports innovation.” He goes on to describe it “as a human-centered approach driven by divergent and convergent thinking, customer empathy and iterative learning” (Design Thinking 4th Edition, pg. 74). At its core, Design Thinking is a problem-solving toolkit used by cross-functional teams or individuals to solve a variety of problems. As a process, Design Thinking consists of 5 main phases — Empathize, Define, Ideate, Prototype and Test (Source, Interaction Design Foundation). I will discuss how we use each of these steps during our Subscriptions MVP project. The Subscriptions MVP project centered around how to create a service where customers can set-up regular deliveries so they don’t run out of supplies. The business goal was to drive revenue, loyalty and convenience. From the beginning of the project, the team maintains empathy with our customer through observation and questioning. At this stage, our teams immerse themselves in the customer’s environment to reframe the problem. Specifically, we explored several competitive companies and also drew on insights gathered from our research team. This information informs the learnings used for the duration of the Subscription MVP project. Once these observations are complete, we further explore the problem space using additional stakeholder insights. These create a well-rounded view of the challenge from the business, technical and user’s perspective. Next, we synthesize the results to define the core test assumptions, and finally, the team establishes a problem statement that identifies the challenge to solve. In this example, we set to design an MVP experience where users can set-up a single recurring subscription utilizing quantity and frequency. Now that the target challenge is selected, we explore design solutions using divergent and convergent thinking. Think of this as a combination of non-linear and linear thinking. The goal is to discuss as many ideas as possible with little judgment or analysis. We use blue-sky exploration to generate as many ideas as possible. This occurs in a non-linear, casual environment. Next, teams capture ideas and refine the direction using linear exercises that leverage the group brain to land in one direction for prototyping. Now that a design direction is selected, the team creates a variety of prototypes aimed at investigating the solutions gathered in the previous step. Each solution is explored then tested with the results accepted, reframed or rejected. Once the prototype is complete, it is tested with real users to validate or invalidate the Subscription flow identified through observations and defined in the problem statement. Since Design Thinking is an iterative process, the results generated in this phase are often used to redefine the problem and further explore user needs. Iterative design is a hallmark of innovation as teams seek to reframe problems for continuous learning and improvement. In this instance, we validated an MVP design and used our finding to inform Phase 2 of the Subscription’s project’s roadmap. To successfully scale, education is at the core of their initiative with over 68 project teams and 500 leaders participating in a Designcamp. 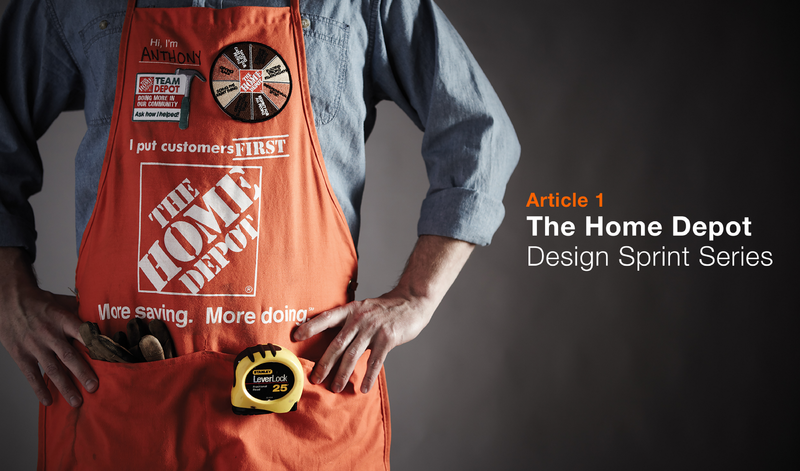 Here at The Home Depot, we introduce Design Thinking at the foundational level across the UX department. Human-centered design through empathy, exploration and iterative learning are at the core of our product teams. Specifically, we start each new project or feature request with alignment around the problem space to make sure we are indeed solving for the right user need. 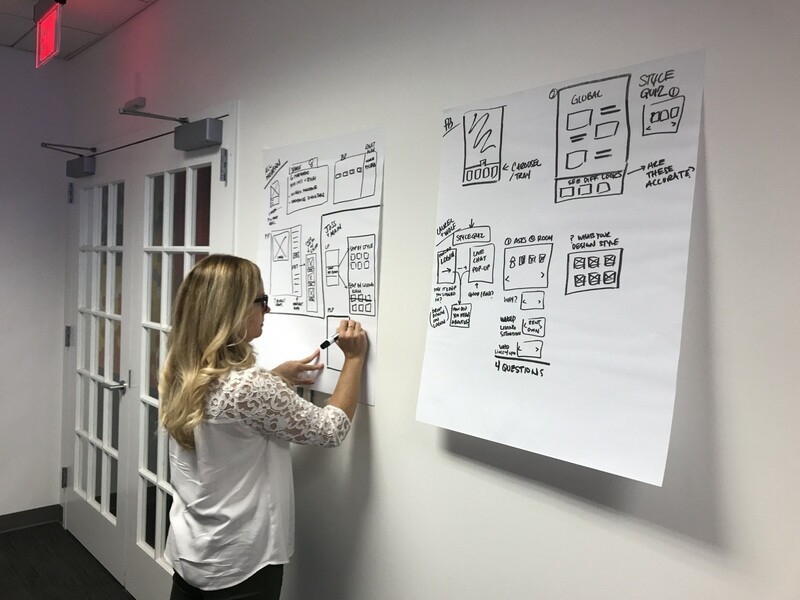 From here the UX team focuses on insights before proceeding with exploring solutions. Next, we use several ideation/refinement techniques throughout our process, and each design is prototyped/tested along the way. Moreover, the additional value in Design Thinking is that it is applicable past the digital space. The Design Thinking training process has gathered considerable traction inside and outside our department. Most recently we extended the process to other areas of our business, such as HR. Our process provides an in-depth view of Design Thinking techniques through real-life application. In a recent exercise, teams generated affinity maps/problem statements that were plotted on a benefits graph for HR roadmap planning. Let’s shift our focus to Designs Sprints. Design Sprints are one tool within the Design Thinking framework that has received a lot of attention lately. Specifically, Google Ventures released the Sprint book in 2016. Their book brought this process to the mainstream as a repeatable recipe for innovation. 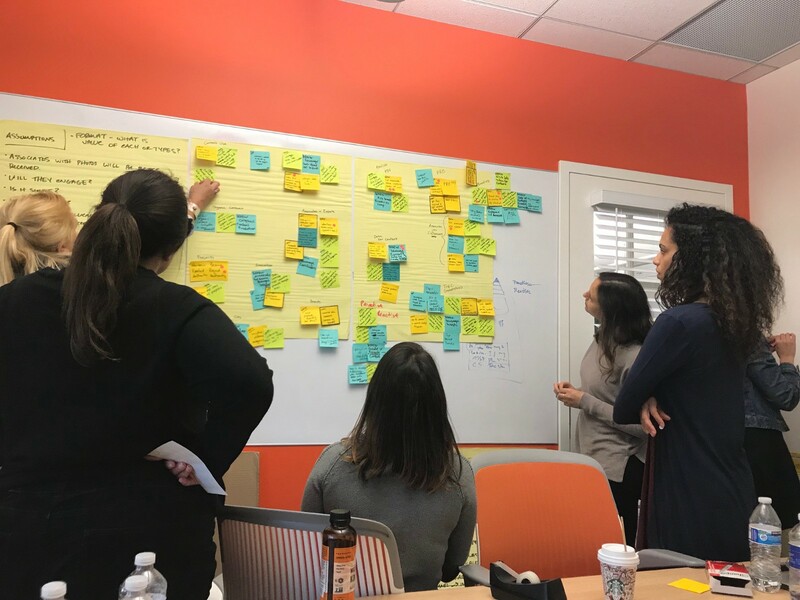 In their process, they outline a 5-day framework for reframing business challenges through mapping solutions, ideating, refining, prototyping, and testing. Consider it a mashup of agile methodology and design thinking. Sprints take the Design Thinking process and constrain it into an abbreviated timeline for refinement/iteration, much as agile development teams do now. Design Sprints are extremely powerful as they allow companies to uncover risks quickly and gather alignment with little investment or time. A fundamental tenet of the Sprint process is convergent and divergent thinking. In this mindset, teams couple exploration with clearly defined steps for refining/testing the solution. This process helps companies stress-test assumptions before going too far in one direction. Ultimately, this helps foster a shared vision and sparks innovation at large. At The Home Depot, we have introduced Design Sprints as the core of our process. Specifically, we use them as an innovation approach at both the tactical and strategic levels. Tactically, it gives our product teams the autonomy to work towards solving a specific set of problems within the confines of the current roadmap. Conversely, from a strategic perspective, we use Design Sprints to explore new problem spaces and ultimately drive roadmap items. In each, everyone is given a voice, resulting in a shared understanding of the problem which allows teams to uncover risks early in the process while simultaneously encourages experimentation in a fail-fast, prototype early culture. Now that we have a foundational understanding of both Design Thinking and Design Sprints, we will explore industry and organizational Design Sprint best practices. Keep an eye out for the next article and thank you for reading. Comments and feedback are always appreciated. Links to other series articles are below.